"It was tough – I went through that transition that probably a lot of athletes go through," said Martin. "You initially think you will play forever, but reality hits that you have to find a career, find a job. It was not my plan to write a book, I was home one day, saw a cartoon and got an idea for a cartoon." While publishing a book is quite the task in itself, Martin took the road less traveled to pen a series of books that incorporates American Sign Language or 'ASL'. ASL is a subject that plays close to Martin's heart as his brother was born deaf. The cartoon Martin refers to was one he watched with his brother's children. The children of a deaf adult are referred to as 'CODA's and typically learn signs before they know how to speak. "I thought it would be a great if there was a show that incorporated ASL, but from there, I created a character whose father is deaf and she is teaching her friends ASL so they can communicate with her father," said Martin. "I thought it would be beneficial, not only for kids, but parents who could read these stories to their kids and learn some signs as well." The idea mirrored the situation that his brother's children faced on a daily basis with the cartoon eventually evolving into a book series surrounding Shelly – a young girl who throughout each book uses her hands to demonstrate how highlighted words are sounded. The approach Martin utilizes is different than most other books. "Kids are attracted to more interactive things, where they are more involved," said Martin. "So my idea was to make a story incorporating American Sign Language that provided involvement between the parent and child." "This way you are not thinking of just turning a page, seeing a sign and then learning the sign. I tried to make it more interactive and that is my goal." Martin hopes that these books can play a part in helping a growing community that uses ASL. The language is now the third-most used in the United States as more than 30 million people are either deaf or hard of hearing. "I thought it would be beneficial not only for kids, but parents to read the stories to their kids, because they can learn some signs as well," said Martin. "A lot of people work in customer service and you never know when you will encounter a deaf person. It will not teach you to be fluent, but you can learn a couple signs." Since publishing his books, Martin has earned some accolades with both of his books receiving 'Five Star Awards' from the web site Readers' Favorite. 'Shelly's Outdoor Adventure' was also recognized as a national finalist in the category of 'Children Easy Reader' by the National Indie Excellence Book Awards that gives recognition to books published independently. More recently, "Shelley Goes to the Zoo" was named a finalist in the children's educational category of the Readers' Favorite Award contest. The book made the final cut of six from over 100 entrants, which included authors from the big publishing houses. Martin will go to a ceremony in September in Miami, Fla. where the winner will be announced. Other opportunities are on the horizon for Martin, who is in talks with a family digital network that plans to launch in the next 18-24 months about bringing the Shelly series to life as a cartoon as he had always envisioned. Many of these possibilities have come to Martin in unexpected ways outside of his immediate family. "Different people have come along and may have messaged me," said Martin. "Somehow they may have known someone that can help me out. I have had more support from people I do not know or have never really met." Though his full-time job, in addition to working on books and raising his family are Martin's priorities, he still keeps up with the Privateer athletic department. A follower of the UNO program on both Facebook and Twitter, the former Privateer guard attended the season opener in November against San Jose State along with Romero. "It was great – just the pre-game activities, we never had that when I played," said Martin. "Even though I enjoyed my time here, if we had that – it would have been even better." Martin also has high praise for third-year head coach Mark Slessinger. "Coach (Slessinger) has a lot of energy and a positive vibe," said Martin. The fans seem to enjoy it and it translates to his players. You see that energy in his players." During his recent visit to UNO, Martin met with Director of Athletics Derek Morel and donated copies of his books to the athletic department so that student-athletes would have an opportunity to see what they could accomplish following their basketball career. Martin also promised to Morel that he would visit campus when he could for another basketball game and to share the lessons he has learned along the way to current student-athletes. 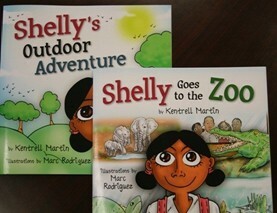 More information on Martin and his books can be found at http://www.kentrellmartin.com. Updates on Martin and other former Privateers can be found by visiting the UNO Athletics Facebook (http://www.facebook.com/UNOPrivateers) and on Twitter (@UNOPrivateers).